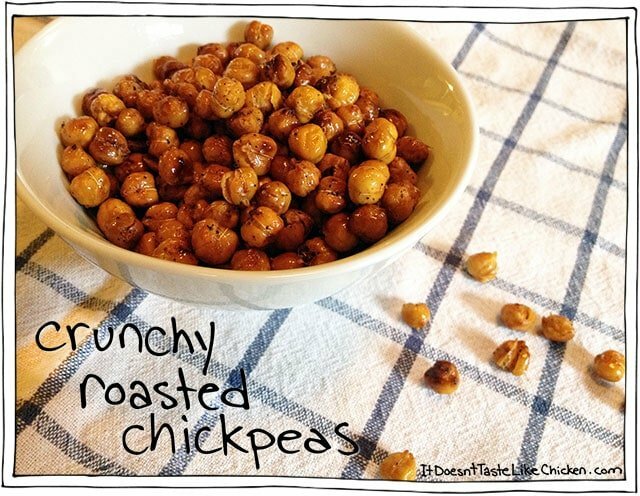 Crispy Crunchy Roasted Chickpeas – one bite is delightfully crispy with a slightly tender inside, the next bite gives a loud satisfying crunch, then fingers must be licked to get all the salty goodness off. Repeat. You’re welcome. 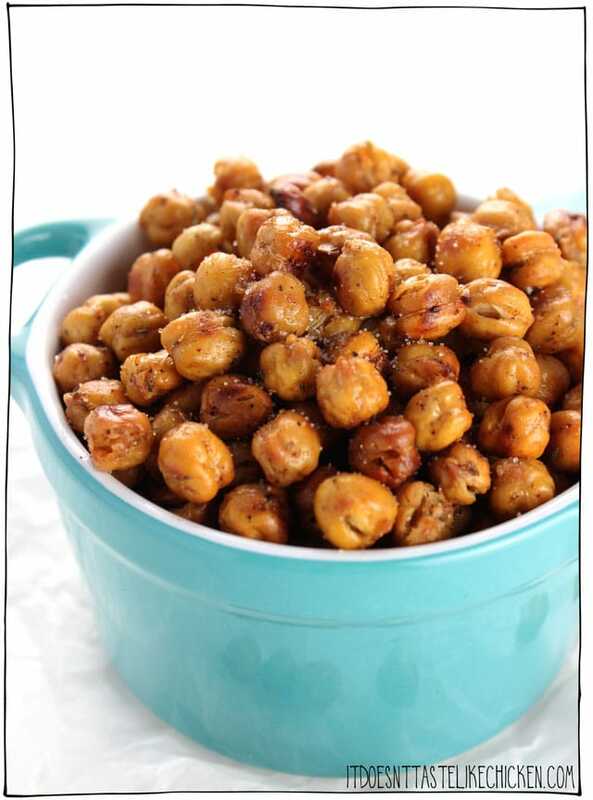 Crispy Crunchy Roasted Chickpeas are one of my all-time favourite easy salty snacks. There are many recipes for roasted chickpeas floating around but from my recipe testing, many of those recipes resulted in squishy, mushy, or burnt chickpeas, and not crispy crunchy. I’m ALL about the crispy crunchy. After a lot of recipe testing, I discovered the key to crispy crunchy was to dry roast the chickpeas first so they have a chance to get crispy and then season them at the last minute. Boom! Works every time. This recipe isn’t actually new to It Doesn’t Taste Like Chicken. I originally posted it a long, long time ago in my very first year of blogging way back in 2013. See the original ugly old picture ↑↑↑. Back in the good ol’ days when I had zero knowledge of food photography and zero knowledge of recipe writing. I used a phone to take pictures, under regular kitchen lights on my kitchen floor. I had no measurements of any kind, and only gave a vague idea of what to actually do as “instructions”. My how things have changed. …I mean, well… I still take my pictures on my kitchen floor, but floor food is “professional”, right? Have any of you been following along since then? Let me know in the comments. But some of those old “recipes” are still my go-to’s, like this one, so it was time these chickpeas got a little facelift. (And by little, I mean some serious surgery to make this crusty old recipe into sparkling tempting deliciousness). Ahhh there we go. So much better. These little dudes aren’t just for snacking either, they also make for a super yummy crunchy salad topper. Crispy Crunchy Roasted Chickpeas are best eaten fresh, as they can get a little soft when stored, but don’t worry, I promise you will have no problem polishing them off immediately. 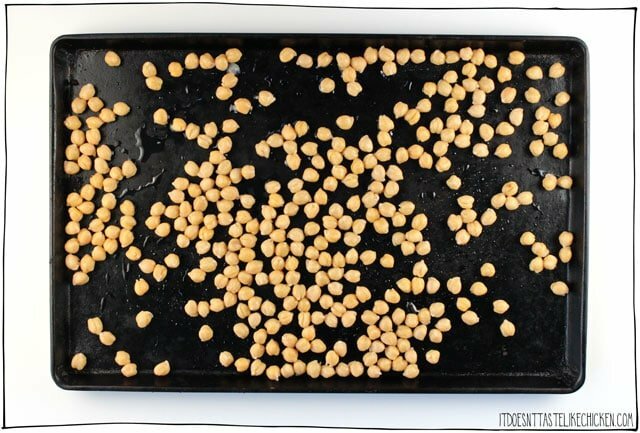 To make Crispy Crunchy Roasted Chickpeas: spread the chickpeas in a single layer on a baking sheet. It’s ok if they are still a bit wet, they will dry out in the oven. Bake 30 minutes, stopping to shake the pan every now and then. Spread the seasoned chickpeas back onto the baking sheet and return to the oven for another 10 to 15 minutes until they are golden and crispy. Remove from the oven and let cool a bit before enjoying. You can snack on them still warm, or completely cooled. The secret to getting them extra crispy is to dry roast them first, and then season them at the last minute. 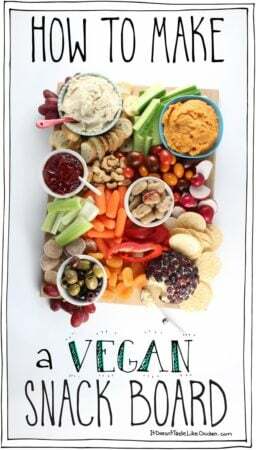 This is an easy to make, healthy, vegan, 5 ingredient snack that everyone will love. Remove the chickpeas from the oven and carefully add the hot chickpeas to a bowl along with the olive oil, chili powder, thyme, and salt. Toss well to coat the chickpeas evenly. Spread the seasoned chickpeas back onto the baking sheet and return to the oven for another 10 to 15 minutes until they are golden and crispy. Remove from the oven and let cool a bit before enjoying. You can snack on them still warm, or completely cooled. Store in an air-tight container in the fridge for about a week. They may start to get a little soft and less crispy. 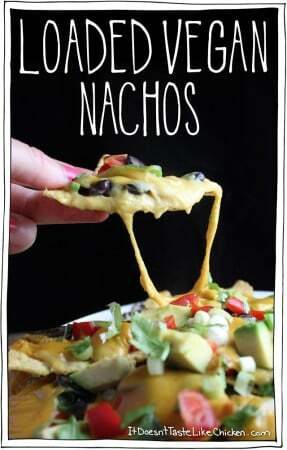 This is an awesome recipe!!!!!!!!!!!!! We prefer them to be softer. If I skip the first roasting step, should that work? Yes that should work fine. Just remove them from the oven when they have reached desired texture. These turned out amazing – thank you! To make them even more flavorful, I added 1/2 tsp. onion powder and 1/2 tsp. paprika. For spice, cayenne pepper. SAM , another great snack but if you use salted can chickpeas you basically don’t need salt. I had 15 oz unsalted chickpeas and I usually always half the salt when making a new recipe . This time I followed the recipe !! For me it was to salty. So if you are salt sensitive don’t use it if they already salted . I just opened another can baked it add it to the second batch than baked it for the remained time . Shouldn’t we save the chickpea juice from the can, which I understand is now called aquafaba? Also, do you have any recipes yet, or any in the works, that use aquafaba? I saw a chocolate chip cookie recipe on a vegan blog site that said aquafaba was the best egg replacer to get moist cookies, out of many others that the blog writer had tried. You can absolutely save the aquafaba to use in other recipes. Personally, I am not a fan of the results when used in cookies, but I do have vegan meringues, vegan marshmallow fluff, and vegan confetti cake that call for aquafaba. Enjoy! Just made these. They were absolutely simple to make + tasted amazing. With a recipe like this who needs potato chips? 🙂 PS – I also added a bit more salt to mine. Thank you! 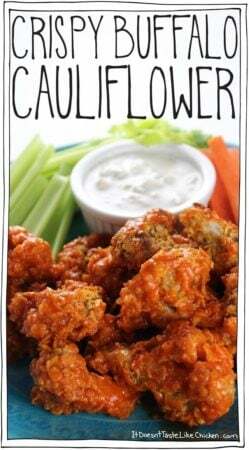 I made these for Super Bowl Sunday. They were a hit. Thank you for sharing it with us. Happy snacking! Wow! Delicious! I added what I thought was a goodly amount of seasoning, and found I needed quite a bit more. Did one batch with olive oil and pink salt, and another with cumin and cayenne. The kids LOVED them! Great way to add protein, and they think it’s simply a great snack! Do you have to peel the outer skin from the tinned chickpeas before baking them? Scrolled a long way down to add my 5 stars!! Wow, doesn’t really matter what flavor combo you decide on at the end, the trick is to bake first, then add oil and season. Thank you for this wonderful recipe! Thank you!! Just made them. They’re actually too hot to eat yet but I’m eating them anyway! Love em!!!!!!! 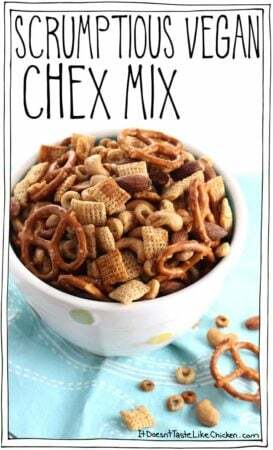 I just made these and they’re really crunchy – not quite “corn nuts” crunchy, but almost! These are now going to be one of the things I make on a regular basis for appetizers for guests, to go along with the usual cheese/cracker/olive/charcuterie. I would also note that I made these from dried beans, cooked in an instant pot. At under $0.20 an ounce for dried beans, this is a very affordable snack to make, and the instant pot does a great job of cooking them from dried to cooked in about 40 minutes total. I’ve just made these and they are amazing! So crispy and delicious, perfect for snacking on when revising!! All of my previous attempts have ended up soggy, thank you so much! What about using fresh Chickpeas/Garbanzo Beans? I have a recipe to fry them for 30-45 minutes until they are golden brown, but I want something healthier with the same hard crunch. With the fresh chickpeas we cook them over night and then strain them for about 2-3 hours before frying them so they are dry. I think next time when I make them I’ll try to bake them after they have dried. We used fresh thinly sliced hobbanaros and serrano’s, a little minced garlic, and salt+pepper for flavor after they were done when they were still nice and hot. They are super yummy!! Hi Valarie, canned chickpeas are cooked, boil I believe, so I would boil them first, drain and rinse, then proceed with the recipe. Enjoy! Finally! I’ve been scouring the internet for roasted chick pea recipes, not for the recipes but to find out what state the peas should be in before starting. It’s as if recipe writers have no idea that chick peas are hard and dry in their natural state. You’d think cooking or buying them cooked or canned would be part of the recipe. Amazing recipe, the dry roast first before the seasoning made a huge difference. Since trying your original recipe we’ve tried all sorts of variations but the favorite is using this as a substitute for a go to snack classic of wasabi peas. 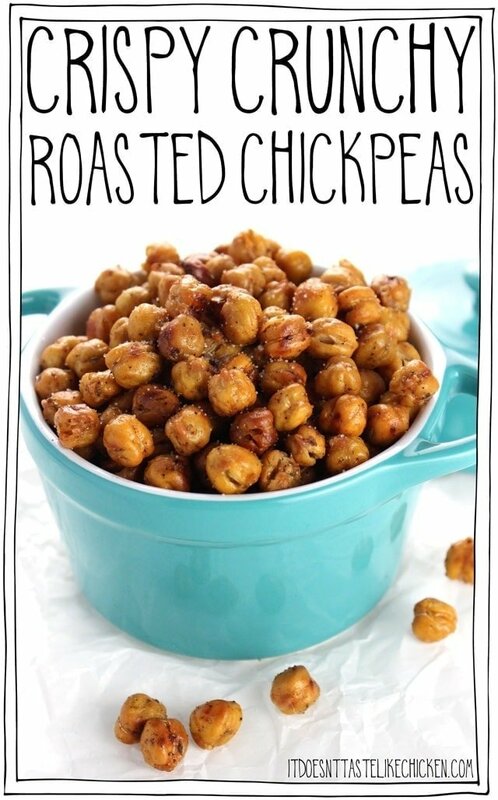 The chickpea is lower cal and most people that try them say they are at least as good if not better. Thanks again for the great recipe! I have a batch in the oven right now, but I used chili and curry powder! I have an exam tomorrow right before dinner so this will be the snack to get me through it! Oh my goodness these are amazing! Thank you for a great recipe! You should remember to mention oven temp in the video. She puts it on here, so it’s a big deal and maybe you should learn some manners. 1st time seeing her and her recipe and I had to search and search for the pre-heat oven temp…..I almost gave up….so I found your post to be informative for her as you’d think it would be a 1st mention in her video…or at the top of the recipe. Hi Coelle, sorry you must have missed it, the oven temp in in step one of the recipe. I forgot to mention it in the video but did put it in the description box, and of course, the full written recipe is right here. I made these for the first time tonight and they are AMAZING. I had to pack them away to keep from eating two can’s worth by myself. I cooked them on tin foil (to keep the pan clean) and parchment paper (so they were easy to get in the bowl for seasoning). Maybe because of this, I had to add about 15 minutes so they would get really crunchy. But boy are they crunchy. I seasoned with salt, a little garlic powder, and a tiny bit of cayenne. Next time I’ll definitely add a little paprika and maybe chili powder. I would love to try a sweet version if these. Maybe brown sugar and vanilla? So very happy you love them so much, Rachel! The sweet idea sounds great too! Honey and sea salt are great, same with sugar free maple syrup and cinnamon if you’re looking for sweet alternatives. Just discovered your blog and I love it! 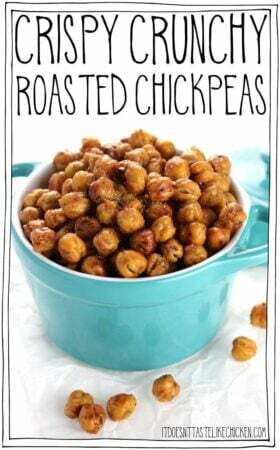 Specially this roasted chickpeas recipe. I will give it a go and let you know how it goes, but I bet it is amazing as everyone in the comments is saying! I have a question, though. I’d love to make a batch in my meal prep day, but I’m not sure how long they will stay crunchy and fresh. How long maximum would you recommend to store them? Sorry if my English isn’t quite well, I’m a spanish speaker. Hi Diana, your English is great! They will keep for a couple of days in an air-tight container. They may soften a bit the longer you keep them, so make sure they are extra-dry before removing them from the oven, and keep them away from any moisture. Enjoy! Finally! Crunchy chickpeas to nosh on! I almost gave up on ever making my own crunchy chickpeas and was just going to resort in forking a lot of money for the little bags sold in stores. I’m so glad that I found your recipe and your tip on making it crunchy. Thank you!!! I’ve already made 3 double batches in a week! Will this work with dry chickpeas? I saw it said fresh but I don’t see them fresh in our area. They sound really good. The chickpeas need to be cooked before you can make this recipe. So canned chickpeas, or chickpeas cooked from dry. Enjoy! Thank you. I thought so but I thought maybe you could buy fresh chick peas like fresh green beans. I haven’t been cooking from scratch for long. Yes, several hours should be fine. Just make sure they are extra crunchy before removing them from the oven. Enjoy! 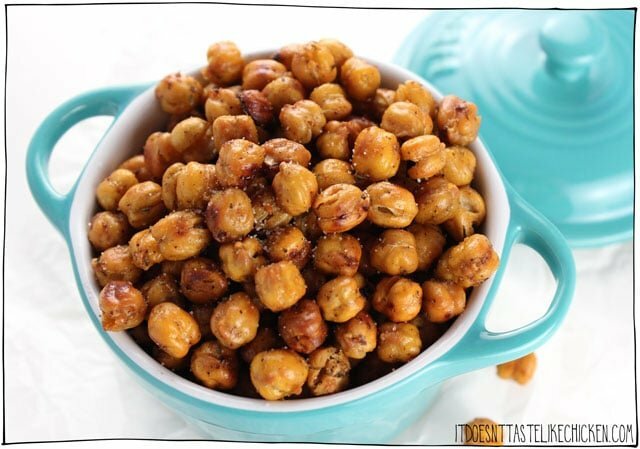 I just made a batch of these chickpeas and they turned out perfectly! Crunchy and delicious. Glad to have a healthy new snack/salad topper. I did use my convection oven and set to 350 because that has worked well for me with other difficult to crisp recipes (apple chips, etc.). So happy you enjoyed them, Christy! Love your website! I’m not vegan, but I got bit by the lone star tick and now I’m allergic to all mammalian meat, milk, cheese, and butter (poultry and fish are safe). I found your blog searching for vegan cheese recipes (the gooey mozz is now at the top of the list of favorites!). Anyhoo, I miss my favorite snack – Snyder’s Honey Mustard and Onion Pretzel Pieces (they contain whey). I really miss the tangly, sweet and crunchy. So I decided to try making my own, and using roasted chickpeas rather than pretzels. I coated them in a mix of honey, dijon mustard, ground mustard, onion powder, garlic powder, and salt. They’re pretty wet after coating, so I reduced the oven temp and cooked them a little longer so they can dry out but not burn (still experimenting with this). I made a batch yesterday, and they got soggy overnight. I returned them to a 300 degree oven for about 30 minutes, and they’re crunchy again. Wow! What an unusual bite to get. So thrilled you love my mozzarella so much, and interesting idea about the chickpeas! I’ve been searching for a recipe to get me the crispiness and crunchiness of a fryer without the whole frying part 🙂 I just made these and they are already half gone. I fear by EOD I won’t have any left! They are insanely wonderful! I added them to a baby kale salad with lemon vinaigrette and grilled salmon and they were the perfect addition. I used used garlic instead of regular salt and added a couple dashes of smoky paprika as well 🙂 THANKS! Oh that’s so wonderful, Shelly! Thrilled you enjoyed them! Yes, mine never last more than a day for sure! Super delicious! I used my air fryer. Al the crunch in half the time. Thank you for sharing this with us! I love the idea of roasting the chickpeas plain first and skipping the whole “pat dry” step. I may experiment with doing the initial roasting on parchment or a silpat or aluminum foil to make it easy to get them into a bowl for the seasoning step. Thank you, thank you, thank you!!! I stumbled upon this recipe and gave it a go! This is truly a fabulous recipe. I make these and take them with me into the movies! 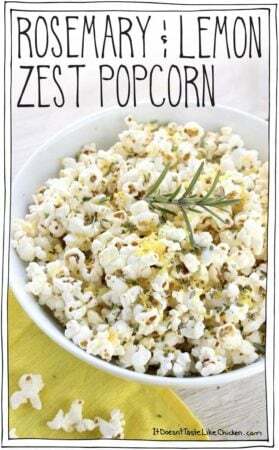 I prefer to eat this than popcorn! Well hold my mule while I dance!! How scrumptious! These little balls of wonder are fantastic. Stumbled across this recipe and they turned out fantastic. Made a few modifications–added a dash of Chipotle pepper and a few turns of black peppercorns, and drizzled apple cider vinegar over them while they coolled! I will be making these again for sure. May even sell them at our new restaurant. Thanks for the easy to follow recipe. I have tried this recipe twice and for whatever reason my chickpeas are coming out slightly crispy on the outside & soft & mushy on the inside. I’ve tried increasing my initial bake time (before adding the seasoned olive oil) by 5-10 minutes; but with no luck. Any other suggestions? Hi Jillian, they will be still a little soft in the middle but should be pretty crunchy on the outside. When you dry roast them they should be pretty crunchy at that point. It’s hard to say without being in the kitchen with you, perhaps your oven is running a little cold? It’s not uncommon. Sorry I can’t be more help! 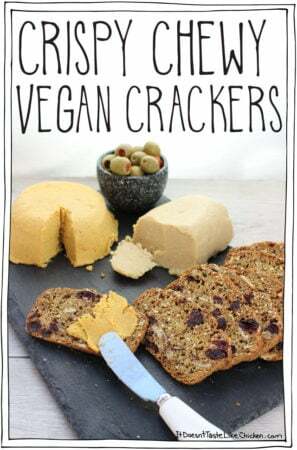 These are delicious but chickpeas make me soo gassy and its the painful kind of gas do you think if i remove the skin it will help so I get less gassy? Will they still be crunchy? I’ve never tried removing the skins but I think it should work well. Make sure you rinse the chickpeas really well before using them, most of the gassiness comes from the bean water. You can also try getting an enzyme such as Bean-zyme to help your body out until it gets more used to eating lots of beans. Seasoning the chickpeas before the last 15 minutes in the oven is such a pro tip! If you want an amazing seasoning that nothing else I’ve tried even comes close to; 1 tbsp Frank’s Red Hot Sauce, 1 tbsp Worcestershire, then garlic powder, onion powder and Lowry’s seasoning salt to taste. Stick into a paste and then toss your chickpeas in this before putting back in the oven. Hope you enjoy! SO much better than Gordon Ramsay’s crispy chickpea recipe!!! Haha, I know right? I tend to polish off the entire batch in one sitting! SO CRUNCHY!!! I will definitely be making these again. I LOVE that you mentioned using these on salad, clever girl! I miss croutons so much and these scrumptious little morsels will be even more satisfying since I know they are a healthier choice, hooray! I have been following you since the very beginning of IDTLC and I always smile when I see a new e-mail. I feel so proud and happy for you, you have come so far and nobody out there deserves success more than you do. Thanks for working so hard to keep all of us healthy, and just as importantly, SATISFIED. I have never tried a recipe of yours that wasn’t simple and delicious. Eating healthy is so much more enjoyable when you don’t feel like you are compromising or missing out! Keep it coming! I can’t get enough! Yum! Soaked two pounds of dried chickpeas overnight and roasted half of them with the spices in the recipe and the other half with salt and smoked paprika. I had to up the second roast time to 18 minutes to get them all crunchy – 10-15 minutes was not enough in my oven. As soon as my husband gets home, these are going to be gone in a flash. These look amazing! Do you remove the skins from the chickpeas first, or just rinse and go? Thanks! Aha! Now I know why other attempts were disappointing. Baked them first and then did seasoning. Delicious. Any recommendation on preparing if you eat oil free? I’m assuming you mean if you don’t eat oil (since the recipe already contains oil). I would just skip adding the oil. You would want to take the chickpeas out sooner as they will get too dry, and you might want to use a bit of lemon juice or other liquid to help the spices stick. Enjoy! The receipe is sooo yummy! Delicious! I’ve been using this recipe often since I discovered it! So yummy thank you!!! Aren’t they addictive!? So happy you loved them Ronda! Hola, se utiliza los garbanzos ya precocidos o hidratados del dìa anterior cuando no es en lata. Entiendo que no estàn totalmente secos (deshidratados) cuando se colocan en el horno. Gracias. Hello , chickpeas already cooked or hydrated previous day is used when it is not canned . I understand that there are completely dry ( dehydrated ) when placed in the oven. Thank you. I’m not sure I understand the question, but I will do my best to answer it. You use cooked chickpeas, toss them with the seasoning, and then put them into oven. The oven dries them out so they get crunchy. Hope that helps! How long do you expect that these can last in a sealed container? 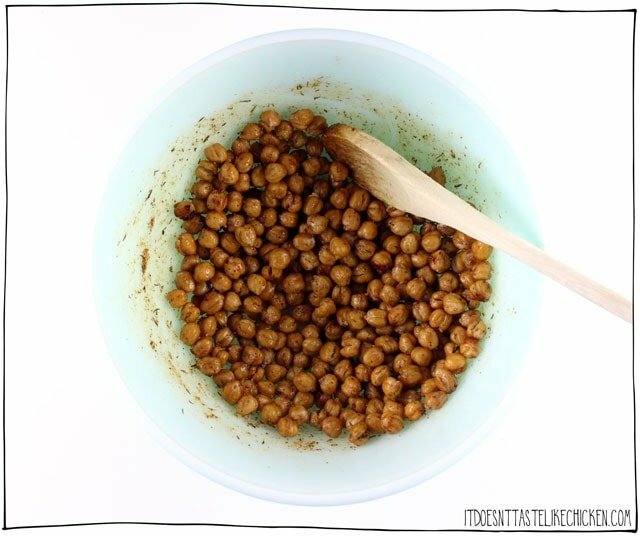 Have you tried this with chickpeas that you’ve prepared yourself instead of out of the can? No I haven’t but as long as the chickpeas are completely cooked, it should work just fine. Enjoy! 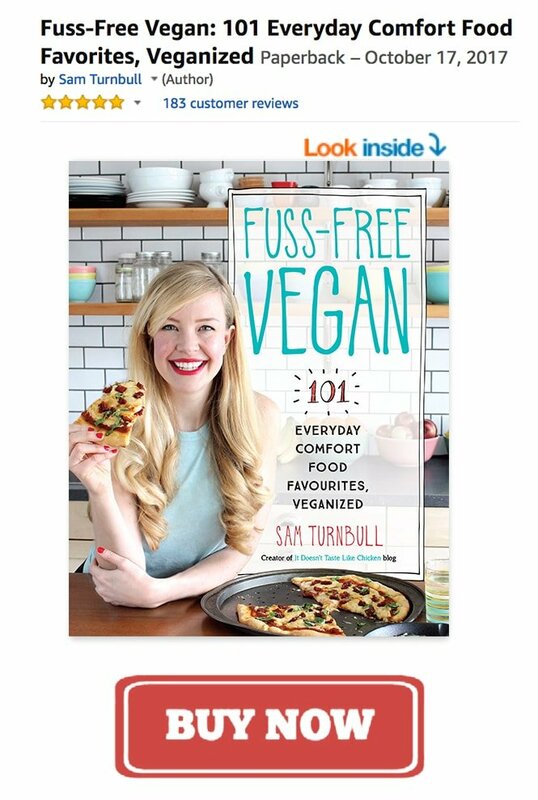 Hey Samantha, I always love the idea of roasted chickpeas and I have tried the a couple of times-they are never crunchy, just shrivelled up. Do you have any pointers for me? Hi! Welcome to my blog! Did you try my recipe for the crunchy chickpeas? There are some other recipes out out there, but my technique of dry roasting them before adding oil and spices gets them crunchy every time!